Ninety dazzling years of the Music Hall for the Performing Art’s history are now on display and ready to welcome the public for a very special event on Saturday, February 9 from 2-6 p.m.
From posters, programs, and props, to tickets, costumes, and architectural artifacts, the gallery tells the remarkable story of the building that opened as the Wilson Theater in December 1928 — and in so doing, shares the history of Detroit through the lens of the performing arts. The Dodge Brothers, John and Horace, founded Dodge Brothers Company 1900 in Detroit. The two brothers both died in 1920, 11 months apart from each other, leaving all of their wealth to their widows. The Dodge Brothers, John and Horace, died 11 months a part in 1920. John’s widow, Matilda, used her inheritance to build the Music Hall. John’s wife was named Matilda Dodge. She inherited part of his $146 million fortune, instantly becoming one of the richest women in the world, and remarried a man named Alfred Wilson in 1925. Matilda Dodge was interested in the arts, including stage plays and Broadway shows. So she used some of her wealth to fund a performing arts center in Detroit to be named the Wilson Theatre. It opened in 1929 and took just six months to build. From the earliest days of the Ziegfeld Follies, the corner of Brush and Madison has hummed with excitement. The stage bears the footprints of Fred Astaire’s velvety steps, the rafters still ring with the melodies of Ella Fitzgerald, and traces remain of Marcel Marceau’s silent magic. 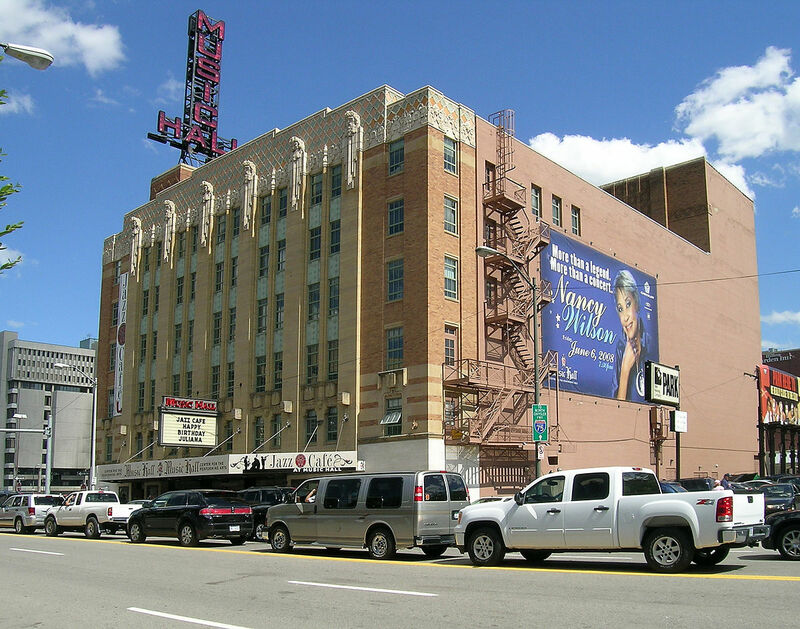 Home for a decade to the Detroit Symphony Orchestra and the birthplace of Michigan Opera Theater, Music Hall is an icon in the Detroit Theater District. Tyler Perry even began his career at the Music Hall with his famous stage plays and the Michigan Chronicle has held its Best In Black Detroit Awards there for the last three years. “It is the only continuously operating theater in Detroit and one of only continuously operating theaters in America,” said Paul. Old books from the Music Hall throughout the years. One and all are invited to attend and to share any personal memories and objects that help to illustrate this remarkable run. In a special arrangement with the Meural corporation, innovators of the Exhibit’s digital display frames, all materials will eventually be shared globally via inclusion in the company’s library of downloadable images. Guests may, if they wish, gift their items for inclusion in the exhibit. “Dig through your closets, attics and basements, and join us for a special community day that celebrates all of the incredible performances that have happened at the Music Hall,” Paul added. The Hall of Decades shows the Music Hall throughout the years, from the 1920s to the present. There is even a wall that features a timeline dating back to the Dodge Brothers starting their car company. There is also an original Grinnell Brothers piano, a dressing room table that Billie Holiday once sat at, and many other historic artifacts. The gallery will be open Monday-Friday from 10-6 p.m. and is free to the public.